After I made those first loaves of whole wheat bread for World Bread Day last month, I have been making it just about every weekend since. My goal was to master the technique completely enough that I didn't have to use the recipe. The side benefit was that I had a seemingly endless supply of home-made bread around the apartment, with enough left over that I was able to give away a couple of loaves. 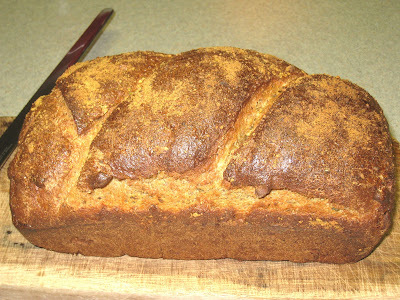 Once I didn't need the recipe, I figured that would free me up to start experimenting with different types of bread. One of my sisters gave me a french bread baking sheet years ago that I've only used once; I'd like to put it back into circulation. Maybe a little sourdough starter hanging out in the fridge. Challah, anyone? The other thing I figured I could do once I had mastered the general recipe is participate in Bread Baking Day, a monthly event founded by Zorra at 1x umrühren bitte. This month's event is hosted by Boaz at Grainpower. The theme for Bread Baking Day #14 is colored breads. Given that I've only been making bread for a little over a month, I was somewhat overwhelmed at this month's theme. Because I am committed to using whole wheat whenever possible, it is quite a challenge to find anything that can have a strong enough visual impact to compete with that thick, rich brown color. But I was determined to try. I also wanted something that would not only impact the color of the bread, but the taste as well. Something that would form an integral part of the dough, rather than just being there to add color. Pistachios have a distinct flavor, and they are a lovely shade of green. I wasn't sure it was a strong enough shade of green to match the whole wheat brown, but I liked the idea enough to give it a try. I ran out of time to make it before leaving Chicago for my by-now annual Austin Thanksgiving trip, so I decided I would make it there, which made it even more of a challenge - cooking in someone else's kitchen. Luckily, I have spent enough time at my brother's house to know my way around his kitchen. I had read a recipe for sesame bread that called for a good amount of sesame meal in the dough, so I figured making pistachio meal would be a good start for this bread. I was going to grind the nuts in a coffee grinder, but my sister-in-law pointed me toward her Magic Bullet blender (WARNING: loud video), which enabled me to process them in fewer batches. 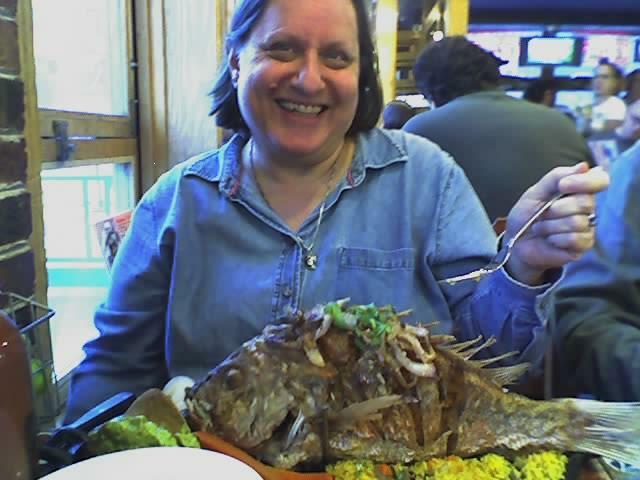 Before long I had a lovely pile of chartreuse-green pistachio meal. This picture does not really do it justice. It is much more green and almost glowing in real life. I added the pistachio meal and some chopped pistachios right after I added the salt and oil. I thought it would replace some of the flour, but I ended up using about the same amount as I would have without it. The dough did look noticeably green, but I did not think it would survive the baking process. I hoped there would be some change, though, especially in the taste. And it didn't take as much as I had hoped. 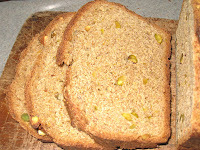 The bread came out a little brighter than my regular whole wheat bread, but most of the green had cooked out. If anything, one might say that it has a touch of yellow. 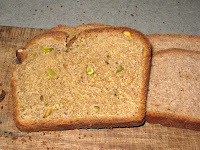 Here is the pistachio bread next to a slice of my regular whole wheat. You can definitely see a difference, but it's only noticeable when the two are together. I also let the dough rise twice for the pistachio bread as opposed to the one rising I gave the regular bread. I like my bread more dense, but now that I see the two together I think I will start letting my whole wheat bread rise twice in the future. All in all, not a bad experience. We could not discern any hint of the pistachio when the bread came out of the oven yesterday, but this morning I toasted up a couple of slices for breakfast and I could definitely taste it. It added a slight sweet nuttiness that went well with my scrambled eggs. As usual, I learned much from this event. I am most pleased that I was able to take a basic bread recipe, fiddle with it, and still come out with a recognizable product. I no longer live in fear of yeast. I can't wait to find out the theme for next month's bread baking day. 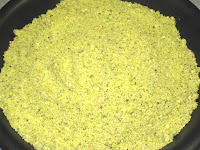 *To make pistachio meal, place raw unsalted shelled pistachios in food processor or grinder and process until coarse meal is formed. Pour yeast into lukewarm water. Add honey. Add 2 cups of flour, 1/2 cup at a time, mixing briskly after each addition. When all of the flour is incorporated, beat batter 100 strokes. Cover with a damp cloth and let rise for one hour in a dark warm place. Sprinkle salt and oil over mixture and fold in. 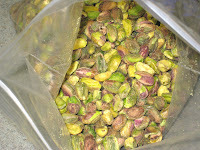 Add pistachios and pistachio meal, 1/2 cup at a time, and fold in. Add more flour 1/2 cup (1-1/2 to 2 cups) at a time and fold in until it feels like you can't fold in any more. Turn onto countertop and knead, adding more flour as necessary, until dough is not sticky and develops a smooth shine. Form a ball with the dough. Pour a little oil into the bowl in which you mixed the dough and spread it around. Place the dough, right side down, in the oil and coat it well. Turn it over so the oiled side is now facing up, cover with a damp towel, put in a dark warm place, and let rise another hour, until doubled in size. Punch it down, cover it again, and let it rise another 50 minutes or so. Punch it down, turn it onto the counter, and form another ball. Let sit for five minutes. Preheat oven to 350 deg. F. Grease a bread pan. Knead ball of dough for about six turns. Starting at one end, roll it up to form a loaf shape. Put it in the bread pan top side down. Pinch together the seams and push down on the loaf so it conforms to the pan shape. Turn it over so it's right side up and push it down again. Cover with the damp towel and let it rise again for 20-25 minutes. Cut two diagonal slices on top of the bread so steam can escape. If desired, mix one egg with 2 tablespoons milk and brush it over the top for a shiny surface. If you have any pistachio meal left over you can sprinkle that over the egg wash.
Bake at 350 deg. F. for one hour. Remove from the pans immediately, then let cool at least an hour before cutting into it. For best results, however, leave overnight. Thanks, Jude. Actually, I think the crust was the best part of the loaf.